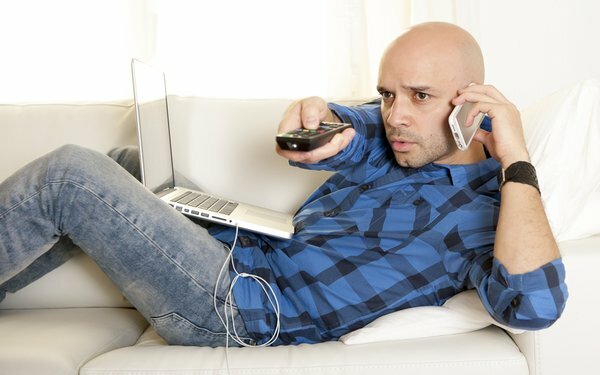 More multitasking in front of big TV screens will occur this year among U.S. adult viewers, but much of it will be unrelated to TV shows they are watching. eMarketer projects that 177.7 million adults will regularly use a second-screen device while watching TV this year -- up 5.1% from 2016. The number of U.S. viewers will rise in 2018 again -- a 4.5% gain to 185.8 million and up 4.1% to 193.5 million in 2019. The data from eMarketer says these are viewers 18+ who use a desktop/laptop or mobile device to access online content while watching traditional TV content on a TV set at least once per month. Mostly adult viewers -- at 131.5 million -- are looking at online content that is unrelated to what they are watching on the TV screen. Far less -- 46.2 million adults -- are accessing digital content related to what they are watching on TV. Viewers' main behaviors are texting, using social media or shopping as they watch TV. 10 comments about "More Adults Device Multitask While Watching TV". Douglas Ferguson from College of Charleston, November 8, 2017 at 12:39 p.m. But mostly during the commercials is when people devote full cognitive attention to their phones. Ed Papazian from Media Dynamics Inc, November 8, 2017 at 12:55 p.m.
To take figures purporting to indicate how many people ever multitask in this manner and conclude that this is what happens during an average commercial break is totally silly. The actual multitasking rate ---per commercial expposure----is a small fraction of the percentages cited in this report. I wonder if the guys at TVision would care to comment on this, based on their "eyes-on-screen" camera studies? Michael Mongelluzzo from Captivate, November 8, 2017 at 5:39 p.m.
Let's be honest Ed...if you have a iPad or iPhone in your hand while watching linear tv on the couch at night, you are looking at that device during many of the commercial breaks at the very least. It's not even close. Ed Papazian from Media Dynamics Inc, November 9, 2017 at 9:36 a.m.
Mark, I happen to skip many TV commercials as you probably do as well. But it's a huge mistake to believe that "we" are typical of your average telecast TV audience which is heavily weighted towards older folks and low brows----many of whom find commercials perfectly acceptable and funny or informative. There are camera type studies which show a much smaller incidence of smartphone or other device usage per commercial exposure situation that is implied by the study in question. In addition there are thousands of commercial recall studies producing normative aided recall levels of 30-40% with high scorers doing 35-50% better. How can this be if everyone is using digital devices to avoid commercials every time they appear? Think about it. Ed Papazian from Media Dynamics Inc, November 9, 2017 at 9:38 a.m.
Ooops! Sorry Michael for calling you Mark in my reply. Michael Mongelluzzo from Captivate replied, November 9, 2017 at 10:01 a.m.
Ed Papazian from Media Dynamics Inc, November 9, 2017 at 10:20 a.m.
Michael, I'm not trying to defend something that no longer exists. I'm merely providing factual evidence that shows that what you are claiming is "the norm" for TV/digital multitasking---especially during commercials---simply isn't true---its extent is vastly overstated. I gave you an example of the thousands of commercial recall and message registration studies being conducted on an ongoing basis. I asked how it could be ---if your premise is correct---that so many viewers can recall a commercial, let alone its message, 24 hours after seeing the program where it appeared----if they didn't watch the ad? You might reply that the surveys are all hoaxes or are simply wrong, but I don't buy that---despite some reservations about their methodologies. Also, many TV advertisers conduct ongoing tracking studies measuring how many of their designated target group are aware of their TV campaigns, how many get the basic message, how many were influenced by it. These, too, frequently show awareness---with some indication of what is being claimed----in the 50-60% range, with some doing better. Sure, these levels are lower than they used to be, but if your premise is correct, they should be finding only a handfull of people who have noted their campaigns. Last, but not least, all sorts of sales response studies, including scanner panel findings, show a distinct correlation between TV reach and GRP stats and short term sales response. If almost nobody is watching the commercials, this simply cant be. I could go on and on, for example citing Nielsen's findings about the extent of tweeting during TV telecasts, camera studies, etc. but I see no need to go into such detail. BTW, you really should subscribe to our upcoming annual, "TV Dimensions 2018", which, among many other things, goes into the subject of commercial viewing in great detail. Michael Mongelluzzo from Captivate replied, November 9, 2017 at 10:56 a.m.
Ed, I can't recall the study but hasn't Nielsen also done a study where the heaviest tv viewing is being done by a subset which can skew these numbers greatly? The lighter affluent tv viewer which are the people that advertisers generally want are not doing as much linear tv viewing? No? Ed Papazian from Media Dynamics Inc, November 9, 2017 at 11:13 a.m. Absolutely, Michael. For decades Nielsen and every other study---MRI, Simmons, etc.---has shown that older people and those with the lowest educations and/or incomes, watch about half as often---and sometimes less---that the younger and best educated segments of the population. Part of this is caused by the latter--younger/better educated---being much less available for early AM, daytime and early evening programming; but the taste factor is also at play. A large proportion of "linear TV" content---not all, but lots---is geared for simple tastes or simply to help people with time on their hands to kill time. Many younger and middle aged/ upscale types---who are in the minority, I'm afraid, simply wont buy into such repetitive pap, hence, for some, they go to Netflix and other content suppliers. Still, even a Netflix subs uses "linear TV" more often than Netflix content, focusing mainly on the wide variety of offerings on basic cable as well as sports, news, talk shows, etc. that are much less available on SVOD/OTT. Ed Papazian from Media Dynamics Inc, November 9, 2017 at 11:58 a.m.
Just want to clarify my last comment. What I meant to say was that the research shows that old folks and low brows watch about twice as much TV and sometimes more than younger and better educated adults---not less. Sorry about that. My sloppy typing may have given the opposite indication. And, to Michael's question, approximateky one fifth of the adults--mainly old folks and those with low incomes, but not exclusively----does about 50% of all "linear TV viewing". Cutting it even finer, one tenth of the population probably accounts for about 25- 30% of all viewing.Naturally, this skews the results of any study that measures the extent of digital multitasking while the TV set is on, however, this does not make the findings questionable, it simply projects them to a total viewership base, which is entirely appropriate. If we were focused only on people aged 25-49 with post grad degrees and incomes over $250,000 annually---a very small segment of most TV show audiences----digital activity during TV commercials would certainly be higher than the overall norm.